“All of us, men and women, are affected by a world that idealizes youth and physical beauty. In such a world, it can feel as if our looks dictate our destiny. But that is not true. It is God who sovereignly rules over all men and women. He has determined our looks and our marital status. As the self-esteem crisis among young women intensifies, so do the efforts to find a cure. And while there are good reasons for a healthy skepticism of advertising campaigns or legitimate questions about the merits of publicly funded programs, we all agree: there is problem. At one level, Christians resonate with the messages of well meaning campaigns from Dove, Bloomberg, and others, for we believe in the dignity and the beauty of every human being as created in the image of God. We abhor the shame, discrimination, and poor self-image that are a consequence of our culture’s obsession with beauty. But we have to ask, why do these campaigns fail to change the status quo? As Dove celebrates its tenth anniversary, is the situation for women really much better? Has the objectification of women been eradicated in NYC? More to the point: can a billboard or a commercial, however well intentioned, really solve our struggles with beauty? More significantly, why aren’t Christians better off? Why are our struggles with beauty as deep and intractable as the next woman’s? Why doesn’t the church seem to have a clear and compelling answer for the world’s beauty crisis? 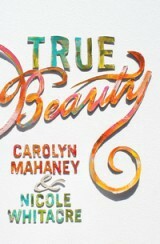 But Scripture has spoken the truth about beauty all along. The gospel of Jesus Christ is the only message that gets to the heart of our problems with beauty and addresses all our body image issues, big and small. Only God’s Word can promise a beauty as supernatural as it is satisfying, as attainable as it is lasting; a beauty that blesses and does not curse; a beauty that is precious, not worthless, that leads to happiness instead of heartache; a beauty that grows more becoming even as you become more beautify. Scripture is true and tells the truth. It alone reveals true beauty. Selfies and mayoral ad campaigns won’t be able to throw off a tyrannical standard of beauty, but God’s Word shows us the path to freedom and joy. The truth of the gospel is the only answer to our beauty crisis. This post originally appeared on the Crossway blog. Happy 21st birhtday to our Chad. We love you! This week, the Supreme Court of the United States will hear the most important religious liberty case in a generation, and it’s time for us to pray. 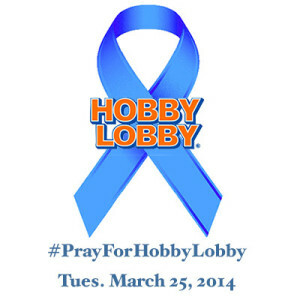 The cases are Hobby Lobby Stores and Conestoga Wood specialties versus the United States government’s mandate that employers provide insurance for contraception, sterilization, and abortion-inducing drugs. Behind that is the larger question of what it means for the Constitution to guarantee the free exercise of religion. So let’s pray that the Court listens to the case being made. Let’s pray for the justices. Let’s pray for the attorneys. Let’s pray, as the Apostle Paul commands us, for “all who are in high positions, that we may live a peaceful and quiet life, godly and dignified in every way” (1 Tim. 2:2). “Scripture speaks truth about beauty for every one of us, whether we have failed to stick with our new diet or been conned into buying another worthless anti-aging cream; whether we feel guilty for our weekend shopping spree, or embarrassed by a bad hair day; whether we are vain and self-absorbed, or fed up with our insecurities. In all our struggles with beauty, whether nagging or consuming, God has provided the wisdom that we need in his eternal Word. Scripture shows us what beauty is and how to become truly beautiful. Above all, Scripture reveals our beautiful Savior, who had ‘no beauty that we should desire him’ (Isa. 53:2) but who hung bloodied on a cross for the ugliest of our sins. The girltalkers are welcoming a new baby this week! No, you haven’t missed any pregnancy news. But this delivery was preceded by many months of aches and pains, and quite an arduous and lengthy labor. Today, I am super excited to announce her arrival. Her name is True Beauty and she is 128 pages long. We hope and pray this book will help many women to see through our culture’s lies about beauty and to find freedom, joy, and true beauty in the gospel of Jesus Christ. You can order now, or go to Crossway.org to read an excerpt from the book. 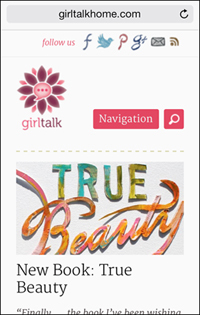 Welcome to the newly redesigned girltalk! Same girls, same talk, but now with a cleaner, fresher look that we hope makes it easier for you to read and explore our content. We’re especially excited because now you can take girltalk on the go. Our new site is mobile responsive, which makes it easy to read and navigate on your phone. Now you can keep up with the latest posts and pictures, or search for advice, encouragement, or a recipe, no matter where you are. Our deepest gratitude goes to Noah Welch who volunteered to give the site a much-needed makeover and did a beautiful job making it more accessible and aesthetically pleasing for our readers. Thanks also to our logo designer Casey Cooke and to Pierce Martin for all your behind-the-scenes expertise. We are in your debt, guys. Let us know what you think and we hope you enjoy girltalk 3.0.